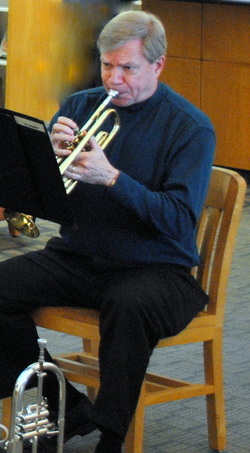 Bob has played trumpet for over 50 years, starting in the 4th grade. 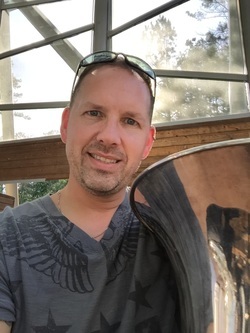 In addition to playing with Festival Brass of Raleigh, he has been a member of the Triangle Brass Band for 21 years, playing both cornet and flugelhorn. Bob also plays trumpet for Casablanca Orchestra, a big band in Raleigh. He also was a trumpeter for the Raleigh Civic Symphony for 10 years. Bob is employed by Southeastern Baptist Theological Seminary. 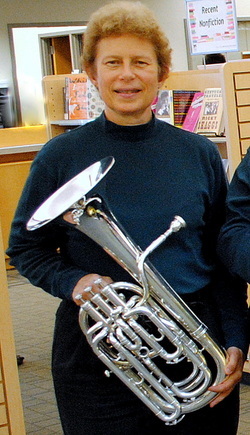 Kathy retired in 2007 from leading Duke University Institute of the Arts and Duke Performances, after a 30-year career as an arts presenter/producer and instructor of Arts Management. It was then that she took up trumpet as an avocation after a 42-year hiatus. 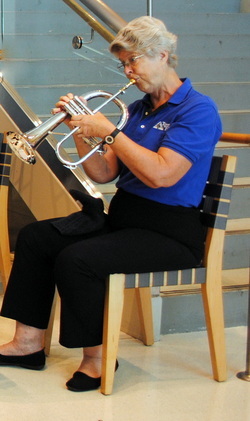 Kathy now spends her time volunteering, traveling, and playing trumpet, cornet and flugelhorn in such groups as Triangle Wind Ensemble, Triangle Brass Band, Durham Bullhorns, Trinity Brass Quintet, Conical Brass Quartet, Festival Brass Quintet, A Touch of Brass, Duke Medicine Orchestra, and other chamber groups. Kathy earned her B.A. and M.A. degrees from the University of Wisconsin-Madison. She lives in Durham with her husband Lex, a retired music history professor (Duke). A native of Florida, Cary started early on piano and violin, migrated to cello, and then fell in love with the French horn playing both instruments through high school and college. She found her way to western North Carolina at the Brevard Music Center for six seasons. She has performed with the Spartanburg and Greenville SC symphonies, Greensboro Symphony, and the Winston-Salem Symphony. Moving to the Raleigh area, she played in the Durham Symphony, Raleigh Civic Symphony and the Raleigh Symphony and several area woodwind and brass quintets. Cary holds a Bachelor of Music degree in Music Education and Performance from Converse College in Spartanburg, SC and a Master of Music in Performance from UNC-G in Greensboro, NC. She is currently a freelance graphic designer living in Durham. 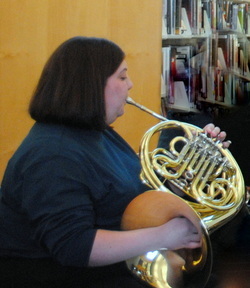 Cary plays French Horn in the Triangle Wind Ensemble and Festival Brass, and tenor horn in the Triangle Brass Band. Her hobbies include stained glass art, photography, kayaking, hiking, biking, and scuba diving. Connie is a Virginia native. 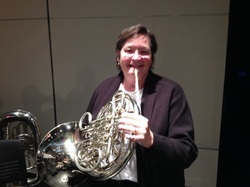 In addition to her role as the founder and manager of Festival Brass, she performs on euphonium (Triangle Wind Ensemble), baritone (Triangle Brass Band), bass trombone (Cary Town Band) and tuba (wherever needed). Connie holds degrees in philosophy and computer engineering technology. She is employed by Cisco Systems as a Network Engineer. Originally from Vandergrift, Pennsylvania, Matt lives in Burlington, North Carolina. He has been in education since 1997 as a band/choral instructor and a school administrator. He has been playing tuba for over 25 years; along with piano, organ, and vocal skills. Matt has been affiliated with organizations such as: The Cape Fear Community Band, The Charlotte Community Band and The Triangle Wind Ensemble. Matt received his BS in Music Education at Indiana University of Pennsylvania, Master in Music Education from The University of North Carolina at Greensboro, and his Master in School Administration from North Carolina State University. He has performed on many global stages and participated in a Choral Conducting Consortium in Varna, Bulgaria.